A few months ago Jeannie from A Pocketful of Polka Dots asked me to co-host her Ageless Style link up with her. She picked the theme "yellow". 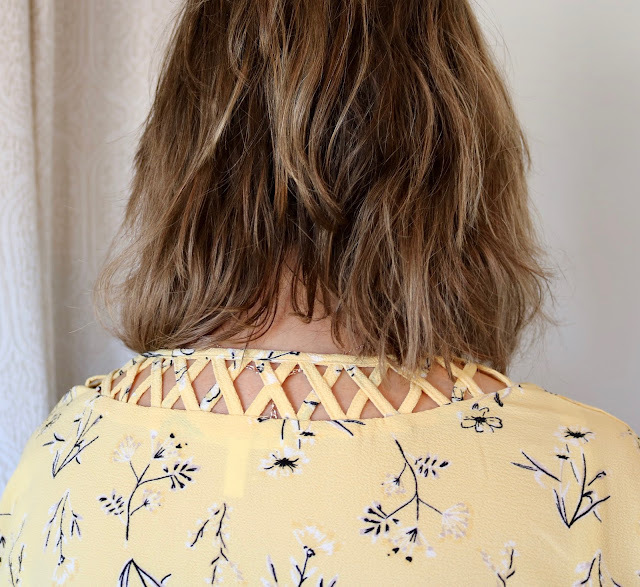 Now although I already owned a few yellow items, I wanted something new to show so I went shopping and picked out this light yellow top from Maurices. 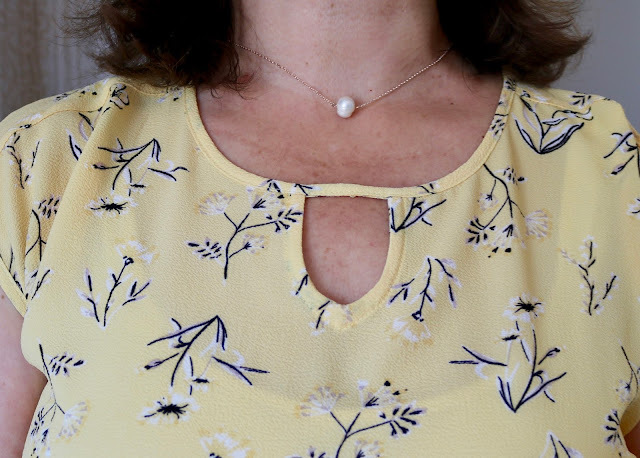 It's a really cute top with some interesting details, but when I saw the pictures I didn't think the pale yellow looked good on me. Whenever I co-host with someone, I want my outfit and/or pictures to look extra special, so back to the store I went. 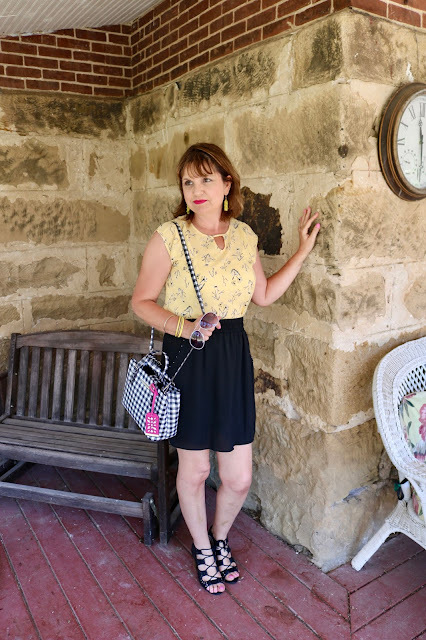 This time I picked out a top with bold, bright yellow flowers in it then I accented it with more bold yellow in my accessories. If you missed that post you can see it HERE. 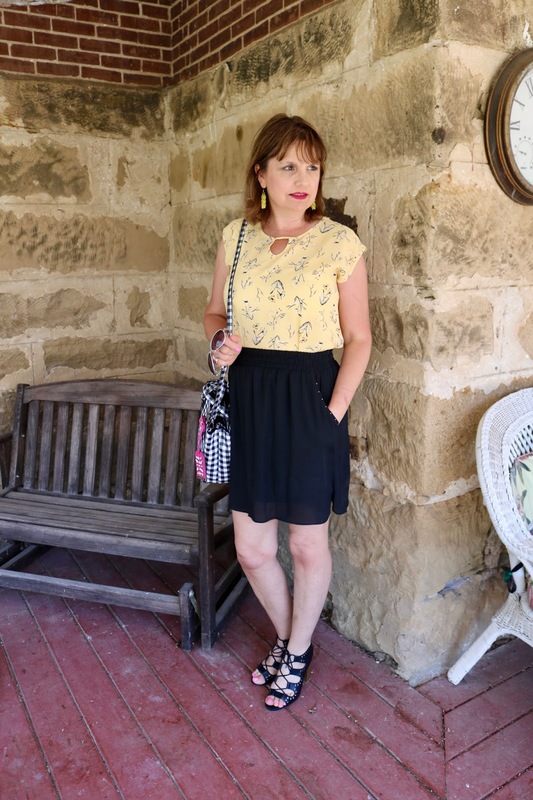 Anyway, for today's fashion post, I thought I'd show you the light yellow top post that never made it to the blog along with how I ended up really wearing this top. The photograph on the left was how I styled the top for Jeannie's link up (but I never wore it this way). The photograph on the right is how I wore the top to church. For the photo shoot, I styled the top with a white skirt, white sandals, and a white cardigan since it was still cold when the pictures were taken. I added yellow accessories to pull out more yellow in the outfit. The skirt is by Worthington and has an exposed zipper in back. 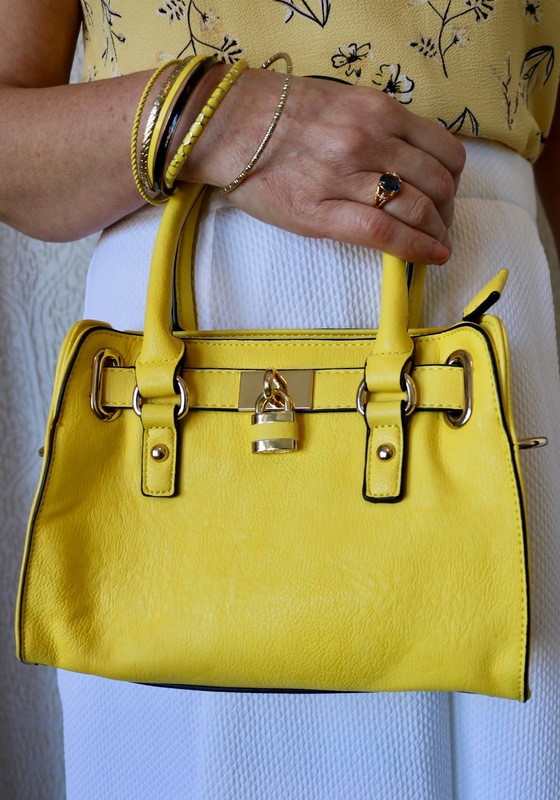 I wore yellow and gold bracelets, rings, and carried a yellow bag from Charming Charlies. My sandals I bought on clearance at the end of the summer last year at JCPenney. The interesting detail in this top is the unique criss-cross neckline on the back of the top and the keyhole opening in the front. Because of the unique opening in the front, I kept my necklace simple and went with a pearl necklace. For my church outfit, the weather warmed up so I could ditch the cardigan. 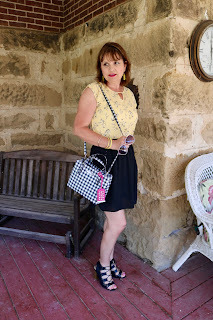 This time I paired the top with a black skirt, black sandals, yellow jewelry and a fun gingham bag. The shoes I also purchased last year on clearance. It's fun to buy things at the end of the season. They are so inexpensive and when I pull them out of my closet the next year, it's a wonderful surprise because I usually forget I had them! Gingham is very popular, but I don't like to wear it on me. A Gingham purse is the perfect way to incorporate the trend without wearing it on my body. So which way do you prefer wearing this yellow top? With white or black ? These are two lovely looks Amy! I must say I love the white with the yellow for spring. Have a wonderful holiday weekend! Thanks Cheryl! Everyone seems to prefer the white skirt over the black one. Now I need to wear that outfit to church! Thanks Ellie! Yes, that purse is to bright for the top. Good thing I didn't wear that outfit out of the house yet. Sometime's I don't notice things until after I see the photos. Both are cute. With white it looks sweet and feminine, with black it looks more chic and edgy. Thank you! Those are good points! Yellow is a color I never wear because I haven't found a shade that looks good on me. But I like both looks. I think you look great in either look though with the white it is more summery. I am a big fan of the exposed zipper like your white skirt has I have a couple of items with this. I never use to wear yellow for the same reason, then the color started trending so I gave in. I find the shade of yellow can really make a difference. I look better in bright, bold yellows than soft yellows. Thanks for commenting on my profile on Blogging Grandmothers! I do love to read--the library is my happy place! I love this blouse on you and think both white and black skirts look nice, but my preference is black. It's a great blouse, Amy. Definitely wear it with white, I love yellow and white! Hugs, x. Beautiful Outfit; very lovely Prints on the blouse and the pairing with whites is my favorite. Have a blessed Week. Thank you! White seems to winning this poll! I think that blouse is perfection, Amy!! Well, then again, yellow is my favorite color so I'm sure I'm biased!! But it's so summery with the white, and the black tones it down!! I love these yellow pieces. It is truly amazing what a different look you can get from styling the yellow with either white or black. Beautiful both ways! Yes, they are very different looks. I didn't realize it till you mentioned it. Thank you! Both looks are lovely Amy! I love your elegant little pearl necklace and your gingham bag. i do like the sunny color of yellow and bought a couple of tops this year. Thanks Jess! I do love the color too but I never dreamed I would wear it. I find the shade of yellow is so important when choosing clothes. I look best in a bright yellow. Thank you so much for linking up to #Fakeituntilyoumakeit Amy. I like the white best... but that's because it's bolder and brighter. Black might make the colour-shy feel more comfortable? Thanks Samantha! The white outfit was definitely the most popular!